Networking is increasingly important these days. It leads to jobs, promotions, stronger relationships and brand building. Whether you have a product or service to offer, or want to just strengthen your name in the market, networking is a must. Who do you want to come to this event? Is it social? Professional? A mix of both? The guest list is very important when planning an event. You want to be sure to have a good mix of attendees, but not so much the mix may turn sour. Envision the event in advance, and plan your guests from there. The theme doesn't have to be overt, and guests don't even have to know there's a theme. This can be your guideline to your guest list, menu, and the attire you suggest. Choosing a theme is as simple as promoting the event as a social scene, professional meet-up, relaxed atmosphere, fundraiser, speed networking or whatever. Be sure you have an idea of how you want the event to go and any results you may need (donations, etc.). Your theme will come easily from there. Venue is important. After determining how many people you want to come, and what you envision the event to be, chose the perfect backdrop. Do you want a swanky summer setting, or a cozy, warm space. In selecting a venue, you must also consider price, sale of liquor, food, and in some cases, parking for your guests. You definitely want people saying good things about your venue when they leave. Once you've chosen your guests, setting, and theme, be sure everything is all set. Go over your guest list again--make certain you didn't forget anyone. Check in with the venue to be sure they are all set time-wise, and see if there are any particulars you need to have in order before the event begins. Also, have all the small things in order. This lends itself to your theme, considering favors, centerpieces and other things which might make your event a little extra special. As the host, you must be there early to greet and make sure everything goes off without a hitch. 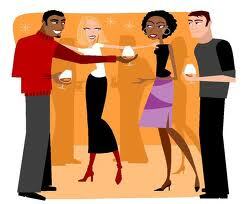 However, once things are going, mingle and check in with your guests. Show them you are having a good time, and the feeling will rub off. Pose for pictures and enjoy the evening--after all, you put in a lot of work. We hope these suggestions are helpful to your next fab social!